A Tribute to the late Archbishop Frank Simon. The Songwriter penned together the words “ Dangers stand thick through all the ground, to push us to the tomb”. In the very midst of life, death walks with us. 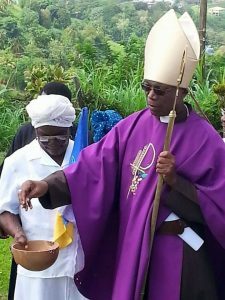 The Spiritual Baptist Community in St Vincent & the Grenadines has lost an Icon, The Late Archbishop Frank Simon has been called from works to reward. News of his death sent shockwaves throughout the country and diaspora. I’ve known Frank for 20 years, and he was one of the most humble individuals I’ve come across. I remember meeting and conversating with him during a wedding ceremony at the St Elizabeth Cathedral in Belmont on June 30th 2018. He wanted to do so much for the Spiritual Baptist Community, especially the younger folks. His constant encouragement to me that day was a testimony of his passion for his fellowmen. Our next meeting would have been September 9th at the late Bishop Ian Enoch’s funeral at Mt Carmel S. B Church in Chester Cottage and again his encouragements were very welcoming. Never knew that would have been our last meeting. The year rolls ’round, and steals away. The breath that first it gave, Whate’er we do, whate’er we be, We’re trav’ling to the grave. The Legacy of the late Archbishop Frank Simon will forever live on in my memory. Sleep on My Beloved, Rest in the arms of Father Abraham until the first trump sound. Mystical Order of Spiritual Baptist Inc.